distictive for its large weave repeat and the sophistication of its pattern, which, as it cannot be achieved on listing looms, is woven on Jacquard looms. Has a variety of possible weaves (and combinations of these). 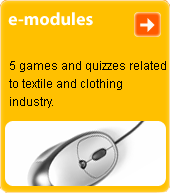 Commonly used in decorative cotton and silk fabrics.